The red grape variety comes from Trentino-Alto Adige ( Italy ). The name probably derives from the Valle Lagarina in Trentino. Synonyms include Blue Lagrein, Burgundi Lagrein, Lagrain, Lagrino, Lagroin and Land Blacks. A "Roter Lagrein" (wine) is called by the Tyrolean peasant leader Michael Gaismair (1490-1532) around 1525. The earliest mention of a variety Lagrein in a document from Gries near Bolzano from 1318 refers to a white wine. Until the 18th century, a "white wine" was usually meant with "Lagreiner". Its identity is not clear, because it could be Savagnin Blanc ( Traminer ) or to Lagarino Bianco have acted. About the parenting (by probably natural crossing) there are two versions, both on DNA analysis based. The Swiss biologist dr. José Vouillamoz determined Teroldego x unknown partner (2006), the French Ampelograph Thierry Lacombe on the other hand Schiava Gentile x Teroldego (2013). It can not be ruled out that these analyzes were two different varieties. The suspected Parent-offspring relationship between Lagrein and Lagarino Bianco turned out to be wrong. 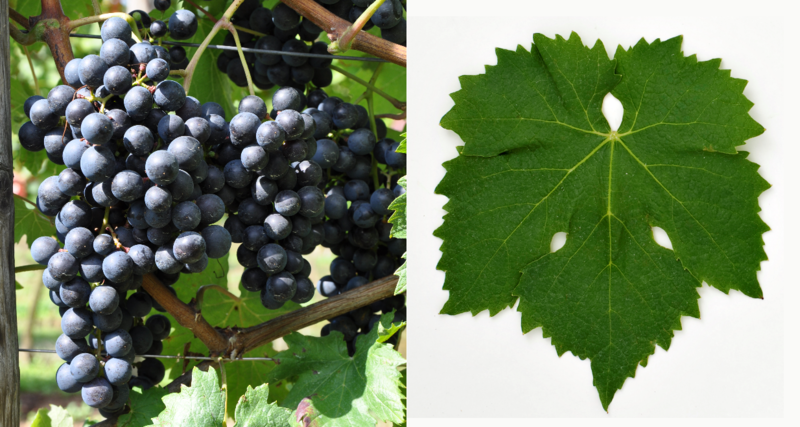 The vine produces colorful, full-bodied red wines with aromas of berries and plums, but relatively few tannins respectively. It is mainly grown in the Trentino-Alto Adige region, where it is often grown with the variety Schiava Grossa is blended. Lagrein is the main variety in DOC wine South Tyrol in the rosé wine Lagrein Rosato or Lagrein Kretzer and in the red wine Lagrein Scuro or Lagrein Dunkel, as well as used as Verschnittpartner in other DOC wines of the region. The variety occupies in Italy 654 hectares with an upward trend. There are more stocks in Brazil (0.5 ha), Romania (0.5 ha) and California (64 ha). In Germany there is a trial cultivation on the Mosel. In 2010, a total of 718 hectares of vineyards were reported. This page was last modified at 10 April 2019 at 15:12.